cooperation, and a diverse blend of residents newly arrived from all over Europe. The soil—gritty shell beaches cut by a crisscross of shallow bayous and lakes—did not lend itself to cotton growing. The vast slave plantations thrived much further east and north in the rich bottomlands of East Texas. The slaves sold on the front porch of the Casimir House, an elegant hotel and social center that used slaves to serve its guests, generally were taken inland by planters who came to Indianola to purchase supplies. Most of the blacks in Indianola were free—having bought their freedom or been freed by generous owners. They worked the docks and they operated pig farms out on Powderhorn Lake. Unlike most southern towns, the residents of Indianola accepted the presence of free blacks, and they were allowed to go about their business without interference. As secession talk grew, and a few agitators arrived from the north, Indianola residents expressed confidence that Southern saber rattling would force the North to back off. 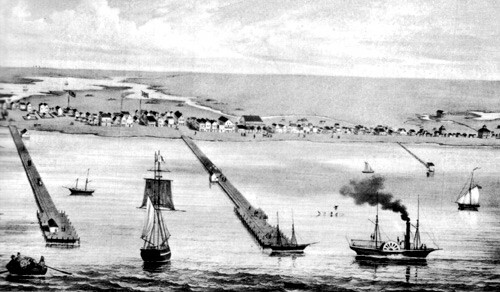 However, after a newly arrived gentleman was forced onto an outbound ship following accusations of being an abolitionist, the city appointed a “vigilance committee,” a patrol to maintain order in the town. 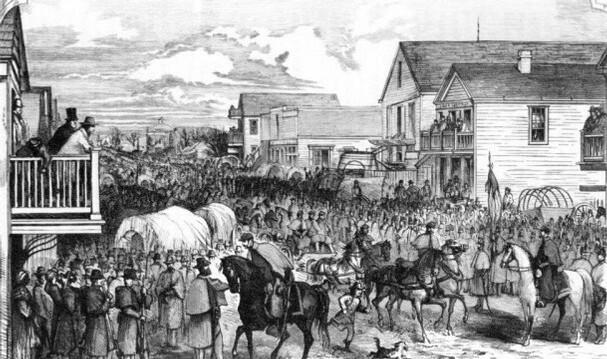 On the night of November 21, a well-advertised mass meeting took place at the courthouse, preceded by a parade. Sam McBride, who owned one of the shipyards on Powder Horn Bayou, led the parade, carrying a flag emblazoned with a Lone Star, the symbol of the former Republic of Texas. Sewn by local women for the event, the flag drew such wild applause it drowned out the band’s rousing march music. Participants carried twenty-eight poles topped by huge, transparent pieces of glass with candle or kerosene lamps illuminating phrases like The Issue is Upon Us; Who is not for us is Against us; The Time Has Come; States’ Right; Millions in Number, One in Sentiment; and The North has Broken the Symbols of Union. The crowd filled the courthouse to overflowing. Judge J.J. Holt gave a rousing speech saying they must take decisive action. Then he appointed a committee to draft resolutions representing the views of Indianola citizens. While the crowd waited for the resolutions to be written, the band played the French national anthem, a stark symbol of revolution. After another loud and emotion-laced speech, the committee returned with support of a secession convention and demands for Texas to reclaim its right to retake the powers it delegated to the federal government when it accepted statehood. The dye was cast.